Our light and airy duvets with Swisswool provide a very comfortable sleeping climate all year round. Wool is not just an insulator, but also acts as a temperature regulator. Because it naturally absorbs and releases moisture, a wool duvet warms you up quickly, but the fabric’s exceptional breathability ensures that you do not overheat. 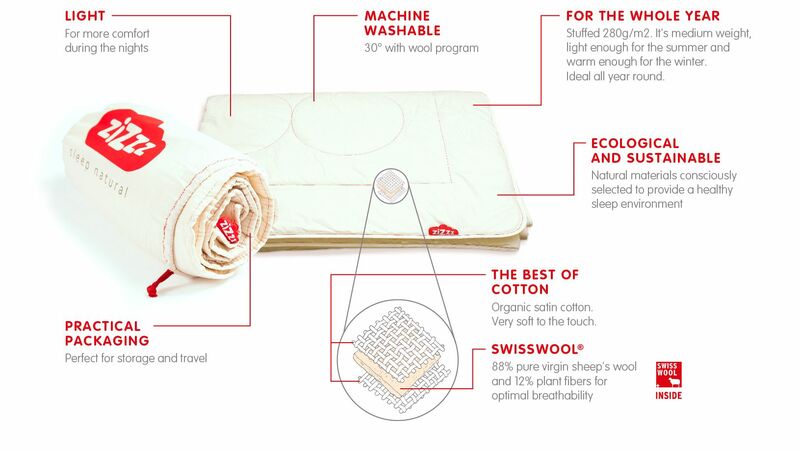 The Swisswool is covered with a very fine fairtrade cotton batist that is very soft and smooth to the touch. Machine washable at 30° (wool program). Muy buena calidad y con una presentación impecable. Very cozy duvet! Each of us have one and they are fantastic: warm in Winter and cool in Summer. Recommended! Heerlijk dekbed! We hebben er allemaal eentje en ze bevallen super: lekker warm in de winter en fris in de zomer. Aanrader!